318 Beacon is located on the north side of Beacon, between Exeter and Fairfield, with 316 Beacon to the east and 320 Beacon to the west. 318 Beacon was designed by Allen and Kenway, architects, and built in 1881-1882 by Vinal & Dodge, builders, and Leander Greeley, carpenter, as the home of George Nathaniel Dana, a merchant and agent for the Eagle Sugar Refinery, and his wife, Caroline Melissa (Dodge) Dana. While the house was being built, the Danas lived at 282 Beacon. George Dana is shown as the owner of 318 Beacon on the original building permit application, dated June 3, 1881, and on an accompanying application to build a stable, dated October 14, 1881. 318 Beacon was numbered as 316 Beacon until about 1889. 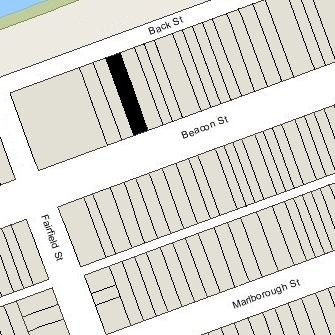 Caroline Dana purchased the land for 318 Beacon on November 8, 1880, from the Boston and Roxbury Mill Corporation. Click here for an index to the deeds for 318 Beacon. 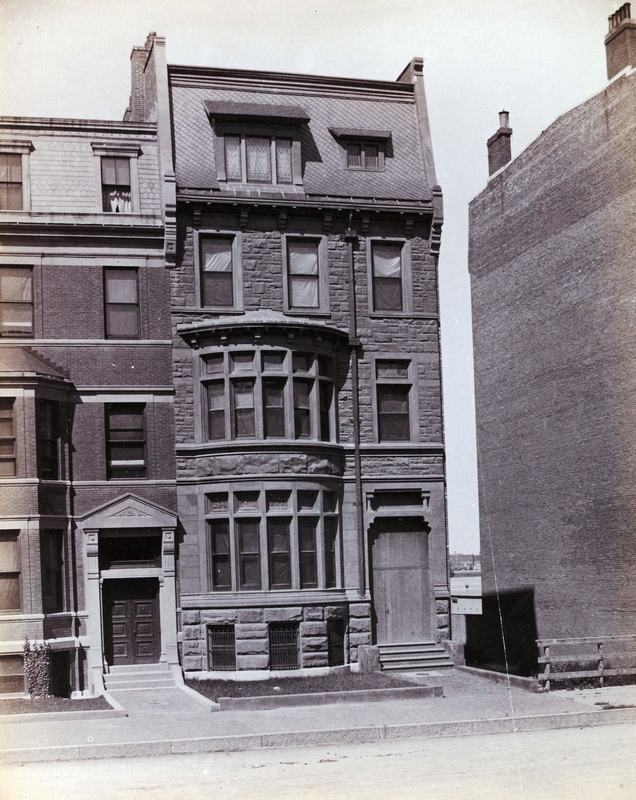 During the 1885-1886 winter season, the Danas were living elsewhere and 318 Beacon was the home of jeweller and bank president Abraham Orlando Bigelow and his wife Olivia A. (Dodd) Bigelow. They had lived at 174 Beacon during the previous season. Their primary residence was in Jamaica Plain, where he died in April of 1887. The Danas had resumed living at 318 Beacon by the 1886-1887 season. They continued to live there until 1899, but had moved to 321 Commonwealth by 1900. On May 18, 1899, 318 Beacon was purchased from Caroline Dana by Edward Glover Niles, a portrait artist. He and his wife, Emily Mary (Wilks) Niles, made it their home. Living with them was Edward Niles’s mother, Minnie (Whitaker) Niles, the widow of Stephen R. Niles. They all previously had lived at 392 Beacon. Minnie Niles died in October of 1900. Edward and Emily Niles continued to live at 318 Beacon during the 1905-1906 winter season, but moved thereafter, probably to New Castle, New Hampshire where they were living at the time of his death in August of 1908. The house was not listed in the 1907-1910 Blue Books. On August 2, 1909, 318 Beacon was purchased from Emily Niles by Madeline (Palmer) Bakewell of New Haven, the wife of professor and future Congressman Charles Montague Bakewell. 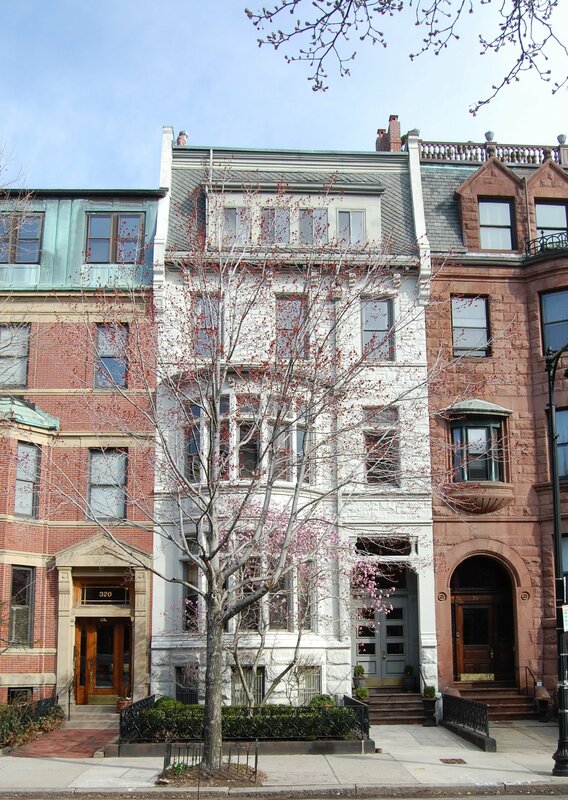 318 Beacon became the home of Madeline Bakewell’s brother, Bradley Webster Palmer, an attorney. He previously had been a lodger at 140 Beacon. On February 7, 1920, he acquired 318 Beacon from his sister. Bradley Palmer continued to live at 318 Beacon until his death in November of 1946. He never married. On December 19, 1947, 318 Beacon was acquired from Bradley Palmer’s estate by wool broker Arthur Ogden Wellman. In January of 1948, he filed for (and subsequently received) permission to convert the property from a single-family dwelling into five apartments. It appears likely that it was at this time that the top floor was remodeled and the fenestration altered (the remodeling occurred sometime after 1942). After it was remodeled, Arthur Wellman and his wife, Sarah (Reeves) Wellman, lived in one of the apartments. They previously had lived at the Hotel Somerset. In May of 1968, he filed for (and subsequently received) permission to convert the property from five to four units. Sarah Wellman died in October of 1968. Arthur Wellman continued to live at 318 Beacon until about 1970. On November 21, 1969, 318 Beacon was purchased from Arthur Wellman by James A. Gillis. He lived in one of the apartments. On June 24, 1974, 318 Beacon was purchased from James Gillis, by then a resident of Miami, by Robert E. Del Col, trustee of the D C Realty Trust. He and his wife, Judith Del Col, lived in one of the apartments. They previously had lived in an apartment at 179 Commonwealth. On September 26, 1985, he transferred the property into both of their names. On July 11, 2013, 318 Beacon was purchased from the Del Cols by WACO Enterprises, LLC. 318 Beacon remained an apartment building, assessed as a four- to six-family dwelling, in 2016.